Function: The Board of Directors shall determine the policies of the organization, see that the objectives and guidelines defined by the bylaws are carried out, and hire salaried persons. Composition: The Board of Directors shall be composed of the officers, the Immediate Past President, Chairpersons of the following standing committees, Chairpersons of selections, Chairperson of the Regional Network, and Liaisons to the Board. The Executive Secretary shall be a non-voting member of the Board of Directors. 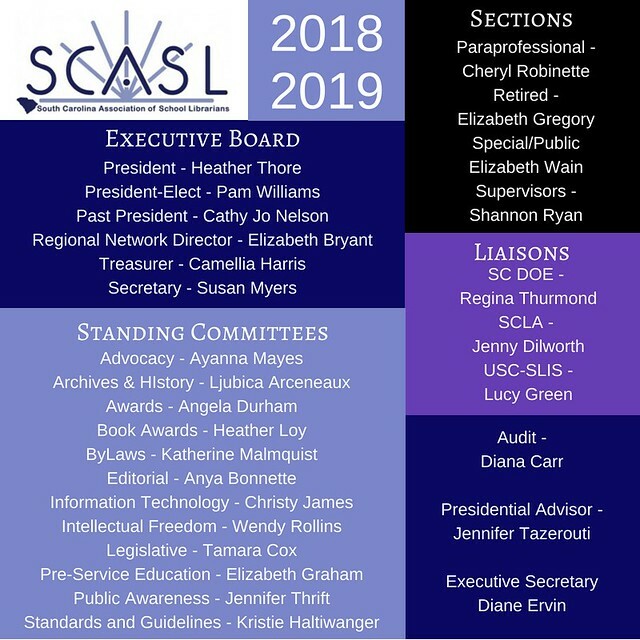 Residency: All members of the Board of Directors shall reside and/or be employed in South Carolina and shall be active members of the Association. Chairperson: The President shall serve as Chairperson of the Board of Directors. Meetings: The Board of Directors shall meet a minimum of four times a year. A board orientation shall be held annually. Members are welcome to attend board meetings. Contact the president to obtain the specific location or online details and time of the meetings. Special Called Meetings: Special meetings of the Board of Directors may be called by the President or by the Executive Committee, and shall be called upon the written request of three members of the Board. Only the business specified in the notice shall be transacted. Quorum: A majority of the voting members of the Board of Directors shall constitute a quorum.